Have you seen it yet? I saw it this morning and I REALLY liked it. I'm a huge action movie fan and this one did not disappoint me. I love the movies and i'm one of those people who is happy to suspend my belief for the fun of it. Cause come on...You cannot curve a bullet. And like Angelina Jolie or not she really does make a great action star. The guy sitting next to me REALLY liked Ms. Jolie and my husband and I had a good laugh after the movie about his reaction to her naked backside. Very fun. And as usual every time I see another action/adventure type movie it reminds me how much I love that genre and want to write more of it. 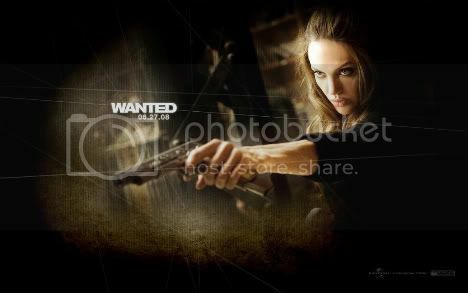 If you like a fun action flick go see Wanted. The last line of the movie (spoiler but not a big deal out of context)says it all. Hey Eliza. I haven't seen this one, and probably won't until it comes out on DVD. The hubby and I aren't really Jolie fans. Went and saw Hancock yesterday. Pretty good. I liked Wanted better it had better pacing and a better background explanation.